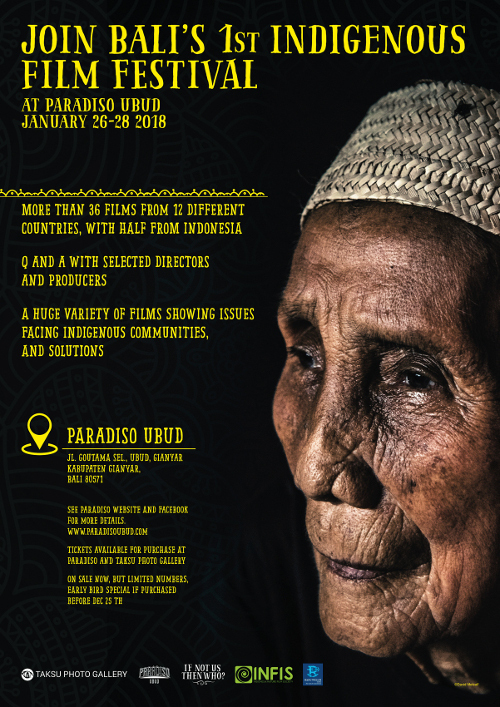 In partnership with “Handcrafted Films”, “If Not Us Then Who”, and “INFIS”, the first ever International Indigenous Film Festival in Bali will showcase a series of outstanding indigenous films this January 26 – 29. These films highlight the struggles that indigenous people face in Indonesia and around the world and communicate the wisdom and knowledge of the first nations people. The festival also brings filmmakers, producers and directors together in a sharing of their projects and an opportunity for Q & A so you, the audience can explore with more depth the messages in these films. Young indigenous filmmakers in Indonesia need support and profits from this festival goes back to helping these young people with their vision and commitment to tell their stories and come up with solutions to presenting issues that will benefit many communities throughout Indonesia. For detailed information and schedule contact Paradiso Theatre.